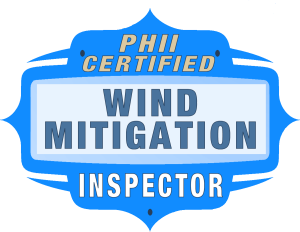 PHII's Online Wind Mitigation Inspection course is 3 hours and qualifies Florida Home Inspectors to perform Wind/Hurricane Mitigation Inspections and expand their business into this thriving field. The course teaches wind mitigation inspections as they relate to the housing and construction industry. Each lesson identifies a specific section of the inspection form and how to write up the report. Our course will thoroughly cover each of the seven sections of the Uniform Wind Mitigation Verification Inspection Form. After completing the course, inspectors are fully prepared and qualified to start performing wind and hurricane inspections. This training is an easy way for inspectors to earn extra income while saving home owners money on insurance. The course is also a good introduction for home inspectors and others in the real estate field who may want to expand their knowledge and training. The course focuses on the major topics that are most important to residential home inspectors. This course will help home inspectors quickly understand how high winds can affect a property and why clients should consider having a wind mitigation inspection performed prior to closing. It is also a good course for other professionals who want to brush up on their knowledge or complete continuing education requirements for licensing renewal. The online course illustrates, and explains the most important components of wind mitigation and reporting in a simple, straight-forward manner. As you complete each lesson, you will use interactive flash cards and take practice quizzes that will test your knowledge, generate instant feedback and provide opportunities to correct mistakes, re-learn information and re-test. Our system keeps track of your progress, so you can take a break at any time, even turn off your computer and the course will return to where you left off. When you finish the course and pass the final exam, you will be qualified to start performing wind and hurricane inspections.